Local food and local art collide on Saturday in Wrenshall. 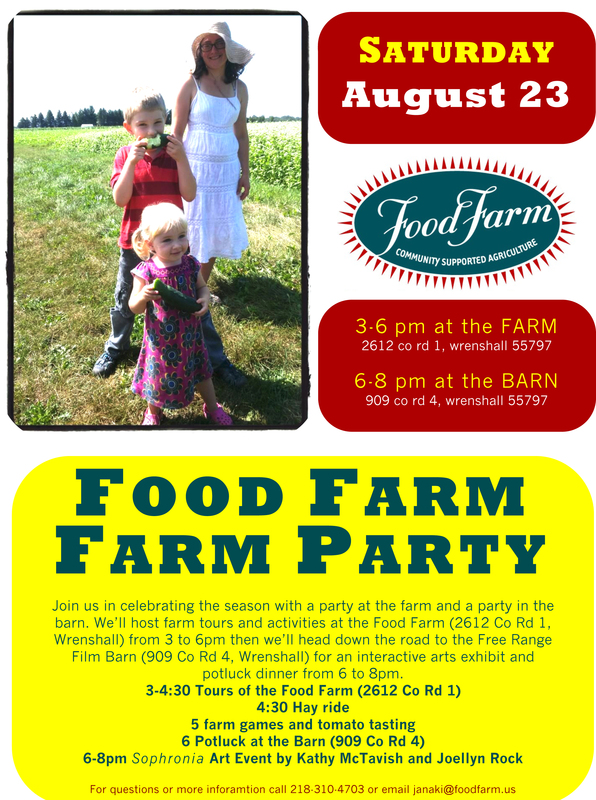 The Food Farm is hosting an open house from 3 to 6pm on August 23rd. Food Farm is the area’s longest operating Community Supported Agriculture farm, raising certified organic vegetables and pastured raised eggs and poultry. Farm tours, a hay ride, family games and activities will be free and open to the public. The farm party will progress into an art party at 6pm when the celebration heads to the Free Range Film Barn. Local artists Kathy McTavish, Joeyllen Rock, and Rob Wittig will present their interactive arts experience Sophronia. The installation premiered at the Walker Art Center during the twin cities’ Northern Spark festival. A potluck dinner will be part of the fest at 6pm in the barn. Popcorn, pop, and water will be available for attendees as well.